Decaf green tea extract. Standardised to contain 98% green tea polyphenols, of which 45% EGCG. Contains 100 capsules. Why use Life Extension Mega Green Tea Extract? Green tea contains a lot of polyphenols, which act as powerful antioxidants in the body. 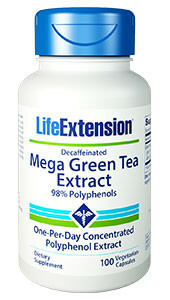 Life Extension Mega Green Tea Extract contains 98% green tea extract, of which 45% epigallocatechin-3-gallate (EGCG). This extract has been concentrated and double standardised to guarantee the highest quality, consistency, and biological availability. 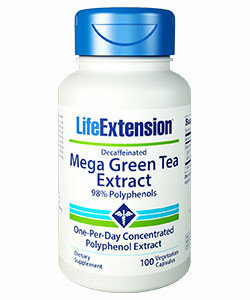 One capsule of Life Extension Mega Green Tea Extract contains more polyphenols than 3 cups of green tea. Additionally, these polyphenols are 60-90% better absorbed into the bloodstream and utilised by the body than polyphenols in green tea. Each dose of Life Extension Mega Green Tea Extract contains a maximum of 3.6 mg caffeine, whereas a cup of caffeine-free green tea contains at least 9 mg. The amount of caffeine in one dose is so low that it will probably not have an adverse effect. 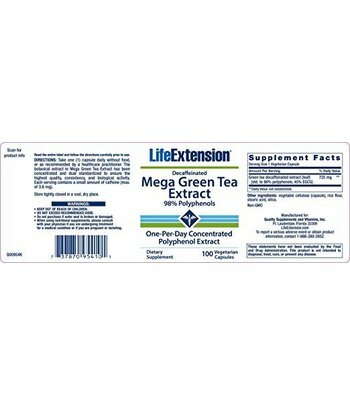 Life Extension Mega Green Tea Extract (Decaf.) is a dietary supplement in the herbal preparation category. 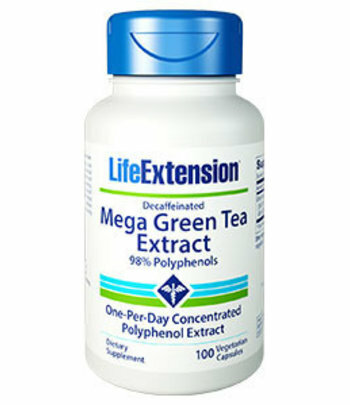 Recommended use: take 1 capsule of Life Extension Mega Green Tea Extract a day separately, without food, or as prescribed by your doctor or therapist. Other ingredients: Vegetable cellulose (capsule), rice starch, stearic acid, silica. Consult your doctor first, if you are under treatment for a medical condition, if you are pregnant or breastfeeding. 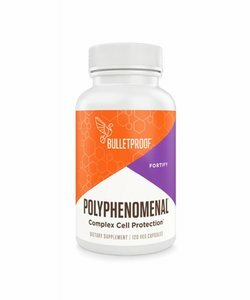 This product is a dietary supplement and is not meant to be a substitute for a varied and balanced diet and/or a healthy lifestyle.